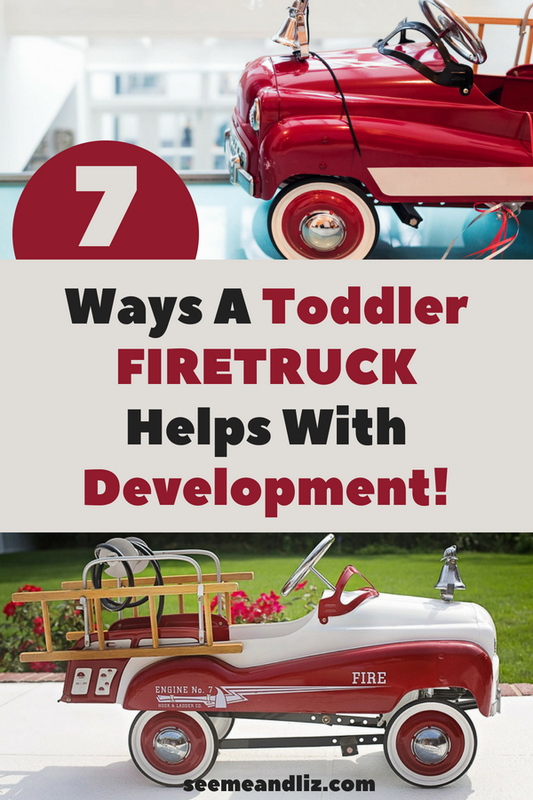 On the surface, a toddler ride on fire engine seems like just another toy, but let me show you why one of these is so beneficial for your child’s development. The ride on fire trucks that I am referring to are not battery operated. They run on motor skills and imagination! The skills your child will learn with a toy like this isn’t limited to a fire engine so if you already have a car, truck, taxi, train, etc. the following will still apply! These days it is a known fact that children are lacking in physical exercise and outdoor activity. Some schools have even cut out physical education, stating that it is not a subject that will help a child academically. This could not be more wrong. Obesity rates are increasing and there is no proof that by removing physical education children are getting smarter. It’s a fact that our brains function better when the body is exposed to exercise. We already know that exercise has benefits for decreasing depression and anxiety and increasing productivity! A ride on toy gets a child moving and these can be used outside. Playing outside has many health benefits for children! While your little one pretends to be a firefighter, she is also strengthening her fine and gross motor skills in a playful way. Getting on and off the fire engine requires use of leg muscles as well as coordination so not to fall off. Fine motor skills are used to manipulate the steering wheel, ring the bell or move the fire hose around! What child doesn’t want to pretend to be a firefighter at one point or another? 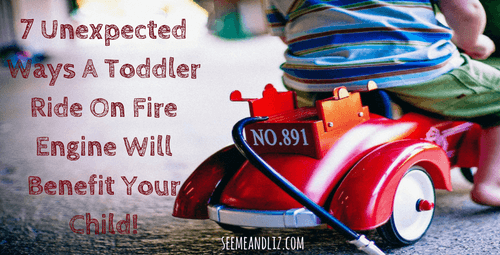 Encourage your toddler to ride around putting out fires to save the neighborhood. Perhaps at one house he will need to save someone’s beloved cat. Maybe at the next house he needs to make sure everyone has gotten out safely. Watch your child pretend to use one of the ladders to climb into a second story window! A firefighter should probably wear a mask so she doesn’t breathe in the smoke. Now you can brainstorm ways to make a special fire fighter’s mask. Could it be that the firefighter needs to stop at the grocery store and pick up some food for her co-workers? Why not! As you can see the imagination and creativity are endless! A ride on toy such as a fire truck can be used during solitary play which in itself leads to independence. It is good for a child to play independently and not need others around telling him what he should do. Watch as your toddler tries to get onto (or into, if you choose to get a cozy coupe style fire engine) and off of the ride on toy. Once on it, he will be able to push himself around with his legs to get from point A to point B. Riding along on a foot powered fire engine will allow your little one to gain the confidence she needs to eventually move to a tricycle and then a bicycle! With a ride on fire truck, you and your toddler can practice using many new fire related words. For example: fire, water, hose, fire engine/truck, hot/cold, wet/dry, ladder, up/down, fast/slow, be careful, danger, burn, smoke, etc. If multiple children are playing together the kids will have to work together. The pretend play scenarios can be extended even further if there is more than one child involved. The kids will be able to practice skills such as turn taking (if there is only one ride on toy that a few children want to use), eye contact, patience, problem solving, etc. Whether it be a real problem such as figuring out what to do if the ride on vehicle has been flipped over, or what to do if 2 children want to use it at the same time, or a pretend problem such as the fire truck running out of gas, problem solving is a skill that can be practiced! Try not to always rush to your child’s aid if a problem arises. Give him the chance to figure it out own his own first. But remember, your child’s age and ability will play a role on how you handle helping your child solve problems. I love this ride on fire engine! It is much nicer looking (it’s made of wood, metal and chrome, the wheels are rubber) than the plastic ride on toys you can find at just about every Walmart or Toys R’ Us. This fire truck is very durable and is the kind of toy that can be passed down for generations. I really like the old school look of it and that it has a small fire hose attached to the back. It also has a working bell! The small ladders on the sides come off too, but obviously aren’t meant for actual climbing, but this is where your child can use her imagination and pretend they are big ladders that can be climbed! This fire engine does not come pre-assembled so make sure you set aside some time for assembly. One thing to keep in mind is that this fire truck is on the small side and is meant for a toddler around the age of 1-3. If you would like something similar but bigger, check this one out! It can hold up to 70lbs. Can you see how easy it is to use a toddler ride on fire engine to benefit your child’s development? Those are some really good points you made. I never thought a simple toy like a ride on fire truck could have so many benefits for a child. My kids have a Cozy Coupe car that they love playing with! But sometimes it gets forgotten about and buried in the back of the garage. I’m going to make sure to bring it out more often! My kids had a Cozy Coupe car too! They would still have it if I wouldn’t have gotten rid of it. My daughter was getting stuck in it! But they loved that thing and had so many great adventures with it. 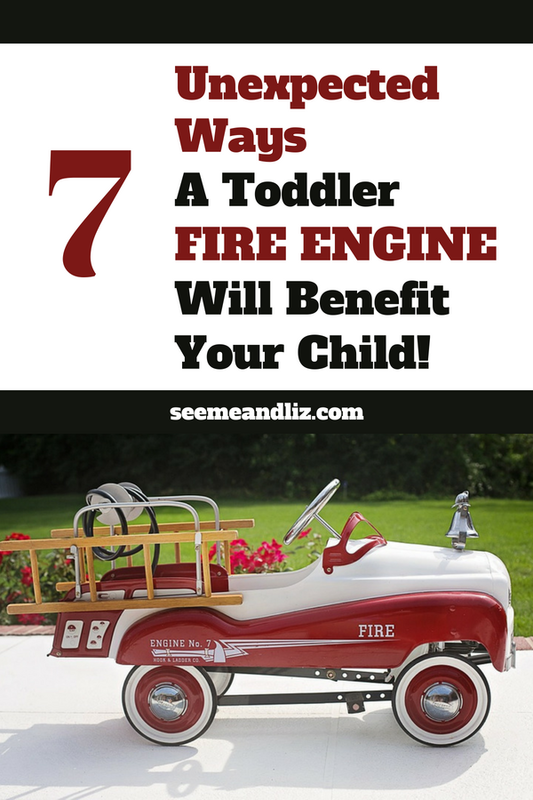 A toy fire truck is just one example, but all of the benefits I discuss would be the same for any ride on vehicle! This article is beneficial for all who are involved in a child’s life in today’s world. Gone are the days when children were allowed to play at their leisure. It may sound hard to say this, but more than one reasons cause this. Would you suggest that parents establish a more friendly association with all who live in their community so that all their children can generally play outdoors together with the fear of danger? Thanks for your comment Dorcas. The world is actually safer now (minus the school shootings, however, we do not have those in Canada where I am) than it was when I was growing up and able to play freely on my own. Here is a great resource for crime stats and children. My biggest suggestion is that parents need to realize that children must be given freedom to explore independently. We cannot live in fear and as a result raise children who are always dependent on those around them. Free play is an extremely important part of child development! The nice thing about the fire engines I discuss in the article is that they can be used both indoors and out! Fascinating article. Who would think that something as simple as choosing the right toy for your toddler could have so many lasting benefits? I couldn’t even believe some schools would be stupid enough to cut physical education from the curriculum for younger children. Because it won’t “help them academically”? There are so many things wrong with that line of thinking. First of all, they’re children; they love to run and play more than anything. And they decide to do this at a time when the child obesity rate in the States is, what, around 25%? Probably not far behind that in Canada. I don’t plan to have any children of my own in the near future, but if I end up with a niece or nephew on my hands I’ll be sure to find them a fire engine. That, and a school that will let them take PE. Thanks for your comment Andrew. My goal is to share with parents how simple toys such as a toddler ride on fire engine can lead to strengthening skills as well as new skill development for their young child. There really is no need for fancy tech toys for young children. And with the way technology is growing, what they learn at the age of 3 will be irrelevant by the time they are 8 (just an example). It is much better for that child to learn some building block skills such as turn taking, problem solving, critical thinking, vocabulary development, asking and answering questions (I could go on and on). Having these skills will allow for success later on! This is a wonderful website and very informative. I have 8 grandchildren and I truly believe in the riding toys as they do offer a great deal of motor skills and problem solving, Your site is very bright and colorful and has a lot to offer and show parents how beneficial it is to the children. Great Job! Look forward to seeing more information on your site . Thanks for your comment Allen! Download my free E-book and I will add you to my list to notify readers when I have posted a new article. From time to time I may also send out links to great deals on toys that will help children with language development and learning. Riding the fire engine is definitely a great exercise for a toddler. I certainly prefer that kind of toy than giving the iPad or something else for the little child like some parents do. You mentioned a great point that fire engine also improves child’s imagination as he/she imagines being a firefighter and the other things during the play. I wanted to check how much fire engine costs and the price was ~120â‚¬+shipping. I was a little bit surprised and it seems quite an expensive for me. Is there any place to buy it in a lower price? Children can spend hours in front of a screen and electronic devices are a lifesaver for many parents when they need a moment to themselves. However, children do need plenty of unstructured play time in order to thrive! A ride on fire engine is a perfect toy for this. The Dalmatian Fire Engine Speedster is specific to the Land of Nod, so I don’t think you can find it anywhere else. Amazon has many ride on fire engines, however most of them are plastic and are still quite price ($80+ US). For something similar to the one I featured you will be spending over $100 US anywhere you look. I found some that were $300 and more. Now that is expensive! My partner and I were in a toy store the other day with our 20 month old daughter. It was Babies R Us or something like that which is a massive department store in Australia. I was quite shocked at the amount of battery operated cars that toddlers can sit in that are flashy and frankly, pretty cool, but totally useless for development of any sort! How times have changed for kids where the use of imagination and physical activity has decreased. I agree with you 100%-exercise makes us smarter and what a shame schools are cutting down on it just when we need it most! Great article and what a cool little fire truck. You’re right, there are so many battery powered cars and kids are drawn to them. They are also usually quite big and a child can’t use these independently (unless you have a lot of open space where you live, like on a farm). I love the Dalmatian Fire Engine Speedster because it is small and classic. It can be used indoors or outside! So the kids will get moving when riding on this.